Solid hardwood floors are strips of flooring made from a single piece of wood, milled with a tongue and groove for nail-down installation. To view our selection of solid hardwood floors and to learn more about the different types of wood flooring we carry, like white oak, birch or maple – visit our Edmonton Showroom! Solid hardwood floors are often chosen when trying to match to an existing floor already in the home or when you need to stay within a budget. Solid wood floors can be refinished numerous times – we bring in solid hardwood in a variety of thicknesses typically 3/8 inches to 1 inch. Most solid wood floors today are factory prefinished. It isn’t ideal to go wider than widths ranging between 1 ½ inches to 3 ¼ inches in solid hardwood floors. The wider the board width, the more chance of gapping in the winter months if the humidity in the home fluctuates. We have other options if you desire very wide planks. If textured or rustic flooring options are what you desire, solid hardwood is likely not the best fit for you. Solid hardwood floors are suitable on main (ground) and upper floor levels, but not below grade or basements due to excessive moisture concerns. We are particular about the solid hardwood we carry as some will perform better in Edmonton and area than others. For example, Maple and Hickory will shrink or gap in winter months more than others. 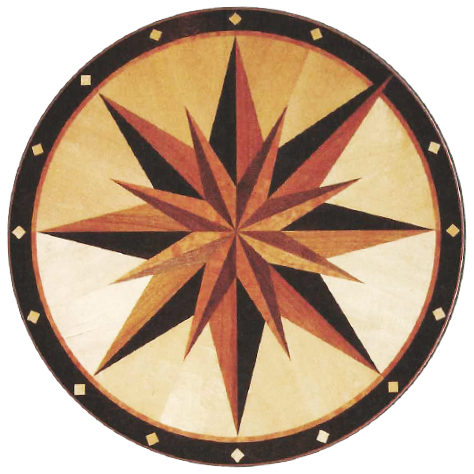 Our knowledgeable staff can help you find the best type of floor for your home. Contact us for expert advice and installation of your solid hardwood floors. * Touchwood Flooring does not recommend Solid Hardwood flooring in widths wider than 3 1/4in in Alberta’s dry climate. Engineered flooring with a Solid Sawn wear layer is recommended instead. Anything worth doing is worth doing well. At Preverco, we apply this ethos to every stage of hardwood floor production. No matter which product you choose, it will make your decor inspired: from the look and texture to manufacturing, nothing is left to chance. Whether you are looking for a floor for the children’s playroom or the master bedroom, you will find a product that meets your needs. Discover the world's finest hardwood floors! Quality without compromise. Mirage hardwood flooring is designed to accentuate the distinctive character of each wood species, resulting in a unique and elegant wood floor design for your home. Our hardwood floors offer superior quality that exudes well-being and gives new life to your home décor. Made in North America, Mirage Floors are synonymous with beauty and durability. Coswick Flooring is produced with the best German woodworking traditions. Coswick celebrates the evolution of hardwood floors. Coswick offers a beautiful selection that is a classic and elegant solution for any space requiring hardwood flooring. * Touchwood Flooring does not recommend Solid Hardwood flooring in widths wider than 31/4in in Alberta’s dry climate. Engineered flooring with a Solid Sawn wear layer is recommended instead.